This is the story of Mollymawk, the Schinas family’s present cruising yacht. 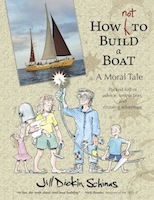 How NOT to Build a Boat gives in-depth details of the lessons which Jill and her husband learnt from their “shipwreck” and describes the way in which we used that knowledge to build a more ocean-worthy boat. Pretty much everything aboard Mollymawk was designed and built by Nick - he designed and built the masts, from steel; he designed and built the transmission system, the main steering system, the self-steering system, and the toilet system. For more information click on the cover image. A tale of adventure and misadventure. In the course of a seven year long “outing” in the Atlantic the author got married, had two kids, and crossed the ocean four times. The family sailed up several rivers, including the Amazon and the Rio Plata; they encountered peasant farmers, piratically-minded customs officials, and Africans in grass skirts; they met a couple of sharks, a crocodile, several whales, and hundreds of dolphins. Eventually they were capsized by freak waves, and this brought the cruise to a premature end. A window on the world of the liveaboard yotty. For more information click on the cover image. Click here to buy a copy. Kids in the Cockpit is the culmination of 14 years of practical research and record keeping which began when Jill’s first child was a newborn baby. It deals with every conceivable aspect of sailing and cruising with children from babyhood through to the teenage years. To read excerpts from the book click on the cover image. Click here to buy a copy. Copyright © 2019 Jill Dickin Schinas. All images and text on this website are copyright and may not be reproduced, copied, or used for any purpose whatsoever without the prior consent of Jill Dickin Schinas.